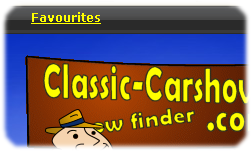 Welcome to Classic-CarShows.com, the easiest way of finding the classic car event for you. 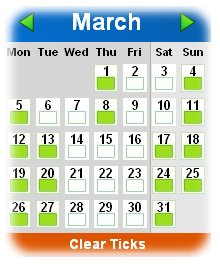 Simply select the month you’re interested in, to compare the basics - location, date, and facilities. Then checkout the details, and, if required, calculate a route to the show. Try it, it’s easy! The 25th Cumbria Classic Weekend proved to be one of the best yet. The Rose and Thistle Challenge on the Saturday endured heavy rain for part of the event which started at the Reghed Discovery centre and took the 60 crews on a 140 mile tour into south Cumbria and Lancashire before finishing at Lowther Castle. Sunday saw the Cumbria Classic & Motor Sport Show at Dalemain Mansion. The weather was much improved with dry and sunny weather welcoming over 600 cars and large crowds. The organising Wigton Motor Club were celebrating their ninetieth anniversary with a display of competition cars covering that age range from a 1923 Bentley to 1 2013 Ford Fiesta WRC car from M Sport. The Club were actively promoting ï¿½Go Motorsportï¿½ and ran a grass autotest with passenger rides and also the opportunity for cars owners to have ago themselves. The best time was by Chris Bell of Penrith in a Mini who won an award and free membership to Wigton Motor Club. There was also a world first in a De Lorean taking part in an autotest! There was also the largest display of rally Toyotas ever seen in the UK which was organised by Toyota rally expert John Midgley. There were also feature displays of Morris, Imp and Aston Martin. The Show uses self judging in the classes and then all the award winners are brought to the arena where the owners who then vote for Car of the Show which this year went to the Aston Martin DB5 of M. Riley. 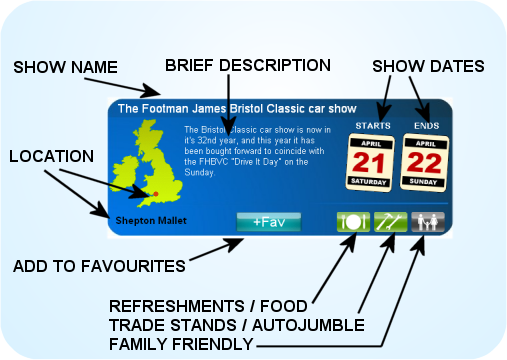 The new "Info-Box" layout us designed to clearly display in an "at-a-glance" format all the information you need. So much easier then reading through lots of text or poorly formatted data! It quickly answers the "What? When? Where?" to help you decide if an event might be of interest to you. The Location and day(s) and date(s) of the event are instantly apparent, as are the main features of the facilities available. Clicking the event name takes you to the full details for that event, also providing a location map and a route planner, to help you plan your day. In addition, the new "+Fav" button allows you to add an event to your personal list of "favourites"
"Favourites" allows you to store events of interest to you, so you can refer to them later. 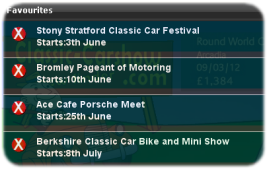 This makes it easy to generate a personal shortlist of interesting events! Once an item is in your "Favourites" list, a new menu item "Favourites" will appear at the top right of the page. This menu lists your favourites, and clicking on an item takes you to the details page for that event. It also allows you to delete an item by clicking the "cross" symbol. Clicking on the "Favourites" link will take you to a "My Favourites" page, listing all your saved favourites on one handy page! So that you know when looking through the event listings that an event is already in your favourites, the "+Fav" button will change colour, and become the "-Fav" button. This can also be used to delete the event from your favourites. Note: Favourites are stored in Cookies on your computer, and can store 20+ events. Using cookies on your computer to store the information means that you do not have to register, and that they are instantly available. The Calendar appears at the top of each months event listings, and allows you instantly to select days of interest during the month. No longer do you have to look down the whole list to see what´s on when you´ve got days free!